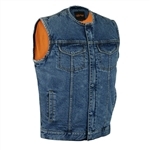 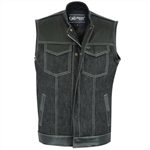 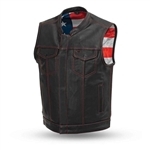 Denim or leather concealed carry motorcycle vests with secure gun pocket, perfect for transporting your fire arm. 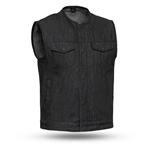 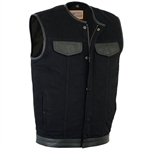 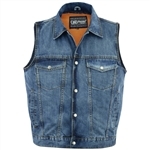 Leather Bound stocks a large selection of concealed carry gun pocket vests in both genuine leather and blue and black denim. 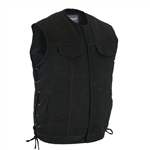 All of our concealed carry vests have specially designed internal gun pockets with strap for your weapon and ammo, most are lined with heavy duty nylon and are reinforced at the shoulder seam for supreme comfort while carrying. 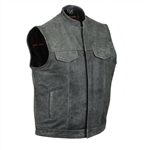 Our dual side gun pocket vests are great for both right and left handed riders or if you prefer to be extra protected and carry two weapons at once! 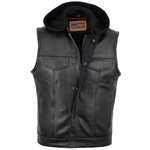 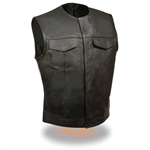 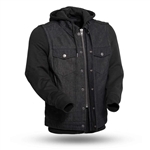 Check out our full selection of men's leather motorcycle vests.